Já pensou em fazer o Treinamento Launch do Transition em Inglês Online? Pois se sim, se anime! Em Setembro/Outubro vai acontecer um! Uma linda oportunidade de saber como iniciar seu grupo de transição, mandar ver sua transição, treinar seu inglês e conhecer pessoas do mundo todo que também querem se aprofundar no assunto! Transition Launch Online is the online version of our very popular face to face fundamentals course in the skills and practices of Transition. Transition Launch Online is packed with imaginative ways to delve into the practice of Transition showing you how to set up, run and grow a Transition Initiative. It is also useful for people who have recently become involved in Transition and want to develop the essential skills and insights to help their Transition Initiative become a success. Here is a detailed description of Launch onLine. The online version will closely follow the two day face to face training, but with the strengths that an online course can bring. 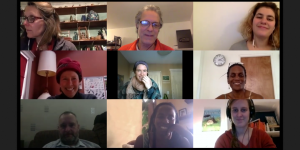 This is a unique opportunity to engage live, online, with people who have been at the heart of the Transition movement from the beginning. As the sessions are live and interactive, you are encouraged to question, explore, and consider what has worked and what hasn’t, how others in your position have approached and created Transition groups, and what made them thrive. The webinars are weekly, 19:00-20.30am UK time (GMT) for 8 weeks starting on 12 September 2017 and finishing on 31 October 2017. As we intend this course to be available to many people in many different circumstances around the world, we have created three levels of payment, and we leave it up to you to identify the price you feel you can pay. We have always had a policy at Transition Network that don’t exclude people on their ability to pay. So if this payment model doesn’t work for you please email us at: training@transitionnetwork.org and let us know what you can pay.